During their travel around the globe they bring along their newest record Knee Deep out on Kompakt Records 11th of April. Their new songs are still funky and energetic but stray away from their familiar pop dance trademark. 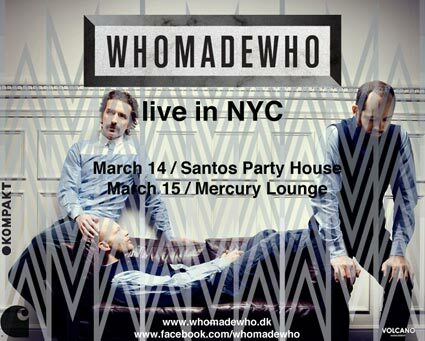 Instead WhoMadeWho show their love for gloomy, reflective songs full of sixties inspired psychedelic harmonies. Soon we will gain a deeper inside into the latest creative output at this point. Here a quick survey about their stage activities. If you got the chance to see them live don’t miss it – they are one of the few bands that do serious business with a big smile on their lips! more dates to follow… .